On February 24, 1959 George, Lucille, and Geraldine Rayfield, an African American family, moved into their new home at 107 Bellanca Lane. 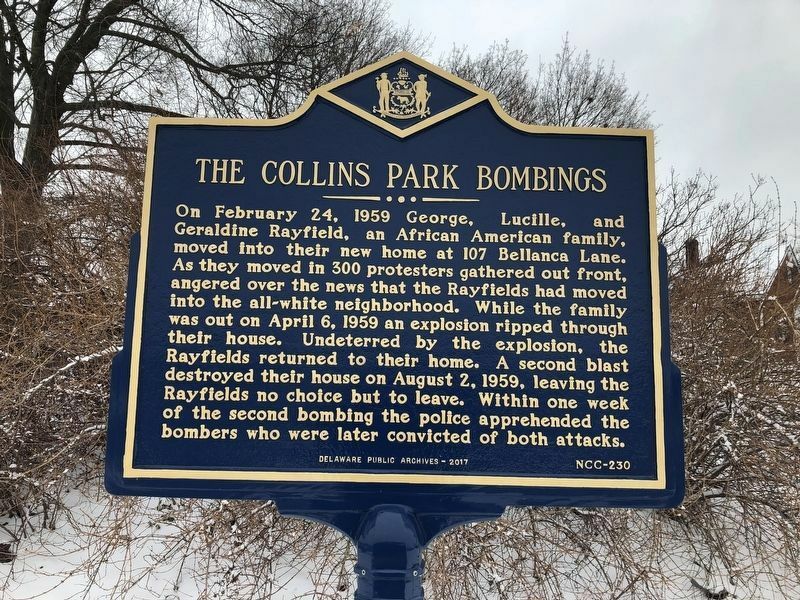 As they moved in 300 protesters gathered out front, angered over the news that the Rayfields had moved into the all-white neighborhood. While the family was out on April 6, 1959 an explosion ripped through their house. Undeterred by the explosion, the Rayfields returned to their home. A second blast destroyed their house on August 2, 1959, leaving the Rayfields no choice but to leave. Within one week of the second bombing the police apprehended the bombers who were later convicted of both attacks. Location. 39° 41.593′ N, 75° 33.263′ W. Marker is in Collins Park, Delaware, in New Castle County. 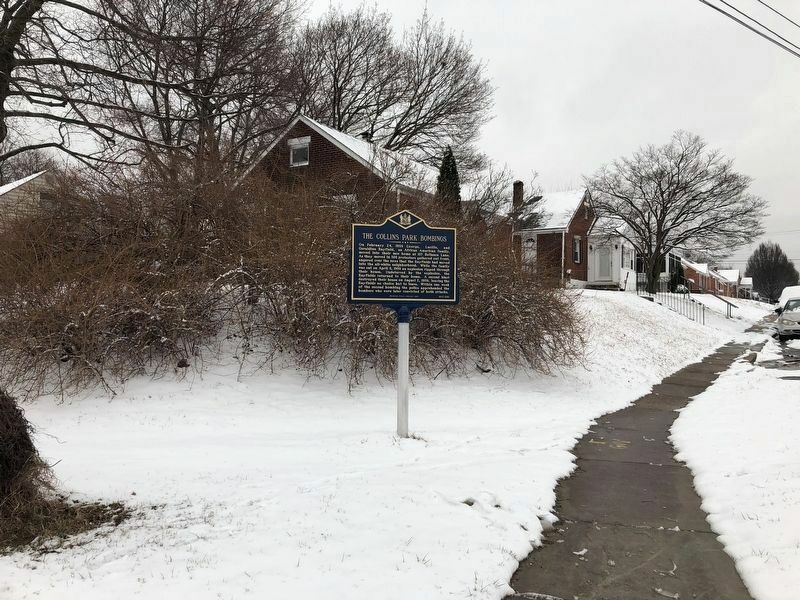 Marker is at the intersection of New Castle Avenue (Route 9) and Cherry Lane, on the right when traveling north on New Castle Avenue. Touch for map. Marker is at or near this postal address: 100 Killoran Drive, New Castle DE 19720, United States of America. Touch for directions. this marker. Wounded Combat Veterans Memorial (approx. 0.2 miles away); Delaware & New Jersey WWII Submariners Memorial (approx. ¼ mile away); Delaware Memorial Bridge (approx. ¼ mile away); Delaware - Desert Shield / Desert Storm Memorial (approx. ¼ mile away); Delaware River and Bay Authority Vietnam Memorial (approx. ¼ mile away); Korean War Veterans Memorial (approx. ¼ mile away); Delaware River and Bay Authority Veterans Dedication (approx. ¼ mile away); The Community of Dunleith (approx. 0.9 miles away). More. Search the internet for The Collins Park Bombings. Credits. This page was last revised on March 6, 2019. This page originally submitted on March 1, 2019, by Devry Becker Jones of Washington, District of Columbia. This page has been viewed 70 times since then. Last updated on March 3, 2019, by Devry Becker Jones of Washington, District of Columbia. Photos: 1, 2. submitted on March 1, 2019, by Devry Becker Jones of Washington, District of Columbia. • Andrew Ruppenstein was the editor who published this page.